Sometimes it's really easy to forget what a beautiful world we live in. It's only been a month or so since my trip to the Australian outback in the Northern Territory and looking back at the photos I took, I am surprised at how I had already forgotten how gorgeous Kings Canyon was. 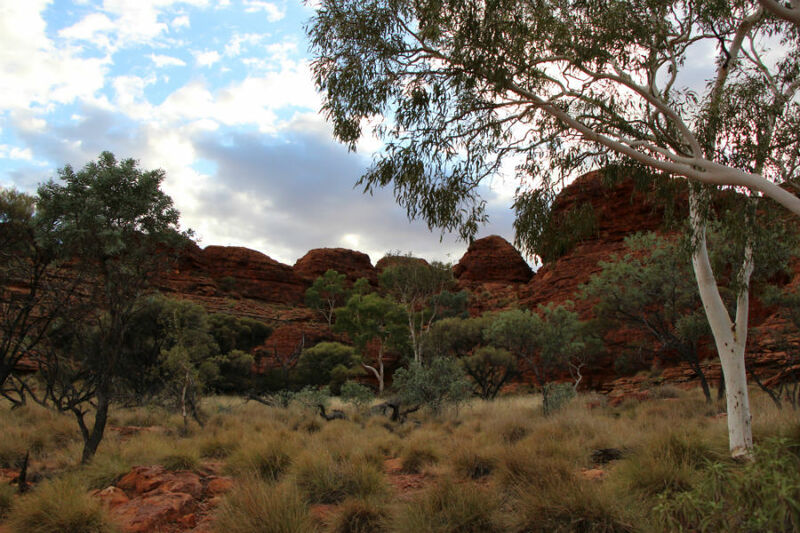 Part of the Watarrka National Park in the Northern Territory, Kings Canyon is situated at the western end of the George Gill Range and is approximately 320km southwest of Alice Springs, or about a three to four hour drive. There are a few tracks to choose from, and we chose the 6km loop which takes about three to four hours depending on your hiking pace. The first part of the 6km loop starts with a really steep climb which locals call 'Heartbreak Hill'. There is actually another steep hill where I live in Rose Bay, Sydney also fondly (well not so fondly) referred to as 'Heartbreak Hill'; I run up this hill a couple mornings a week so I am glad I had trained before this hike because it's definitely not for the faint hearted. After this tough start, we were immediately rewarded with outrageously spectacular views of the gorge below and the surrounding landscape. As we continued on, our guide from The Rock Tour gave us a crash course in local plant life and the culture of the Aboriginal tribe who lived in the area. We learned about a particular plant which had the same affects as the drug which makes you happy and high, as well as how the local tribe used the powder from one variety of eucalyptus as sunscreen.About half way into the hike we descended upon the Garden of Eden (more on this oasis later) and then the last past of the walk was dominated by a large maze of weathered sandstone domes (also more on this later). After three hours or so, we completed the loop and found ourselves on top of Kings Canyon with rock faces that dropped more than 100 metres to the ground below. The heights were a little dizzying but also breathtaking, and sitting on the edge of the cliff is a moment I will never forget. Note: In the very first image, take a look across the gorge and in the middle you can see a person standing; this will give you an indication as to how big Kings Canyon truly is.